The Afropunk Film and Music Festival 2009 stops by Brooklyn with a ton of bands, films and a full BMX/Skateboarding competition with the prize being two tickets to the X-Games. With films happening today, check out Adjust Your Color: Petey Greene, Faubourg Treme: The Untold Story Of Black New Orleans, A Man Named Pearl, Eventual Salvation, Favela Rising, and Hoods To Woods This looks like a great time. Known more for its cheesecake than anything else on its menu, Junior’s also offers fantastic diner and deli style eats from steak burgers to deli sandwiches. If you can make it through dinner, the cheesecake will be worth the wait! One of Brooklyn’s most interesting dive bars, O’Connor’s offers cheap drinks in a place where Park Slope hipsters meet old-time drinkers, making for one of the oddest pairings that works. An excellent place to get schnitzel and goulash and other Austrian delights, Thomas Beisl is right across the street from BAM. Brooklyn music label Captured Tracks hosts the Woodsist/Captured Tracks Festival of psych-folk-punk music featuring Crystal Stilts, Blank Dogs, Psychedelic Horseshit, caUSE co-MOTION!, the Mayfair Set, Gary War, Little Girls, Kid Romance, Beachniks, and the Gutsies. For food in this neighborhood, The Northeast Kingdom is where you want to go. With a seasonal menu of American cuisine with a culinary twist, like the Beef Bourguignon with herbed dumplings ($17), this place offers a relaxing atmosphere for an artist heavy crowd. For drinks, check out Life Café Nine 83. While it’s THE same Life Café that the RENT musical features in the play, it’s not the same location. This new Bushwick locale also possesses a boho vibe, an Americanized menu of ethnic food, and a fun selection of mixed drinks including martini’s and lemonade cocktails. A HUGE space decked out in old couches, Stain is an artsy bar that looks like an old-school coffeehouse yet serves local wines and beers. 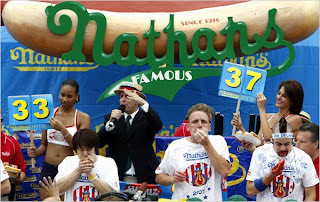 What would a Fourth of July be without the 94th International Hot Dog Eating Contest at Nathan’s Famous? Reigning champ, San Diego’s Joey Chestnut will defend against Takeru Kobayashi of Japan and 20 others in this battle of the bulge. While you may not be a competitive hot dog eater, eating a hot dog, a corn dog, or even cheese fries at Nathan’s Famous goes back several generations. Expect long lines, but it’ll be worth it! Not just a tradition but an institution on the boardwalk, Ruby’s Old Tyme Bar and Grill is a great dive bar for cheap drinks and watching local drunks belt out Rat Pack songs. Even if this minor league Mets team isn’t playing a baseball game, The Brooklyn Cyclones stadium is worth the short walk over on the boardwalk to check out it’s size and beauty. If you’re a fan of music and a fan of seeing lights and big explosions on the fourth, what better way to combine your two loves than by seeing Conor Oberst perform for FREE at Battery Park? The former Bright Eyes leader has long gone solo and here he’s joined by his group the Mystic Valley Band and Jenny Lewis for some more upbeat and southern inspired music than his previous output. Happy Fourth. While many people buy hot dogs and grab a beer at expensive restaurants in the Seaport mall, you’ll be smart and head over to Burritoville for inexpensive and delicious California inspired burritos, all under $10. For drinks, Jeremy’s Ale House has a lively crowd and a beer list that will get you a pint for $5 and under. 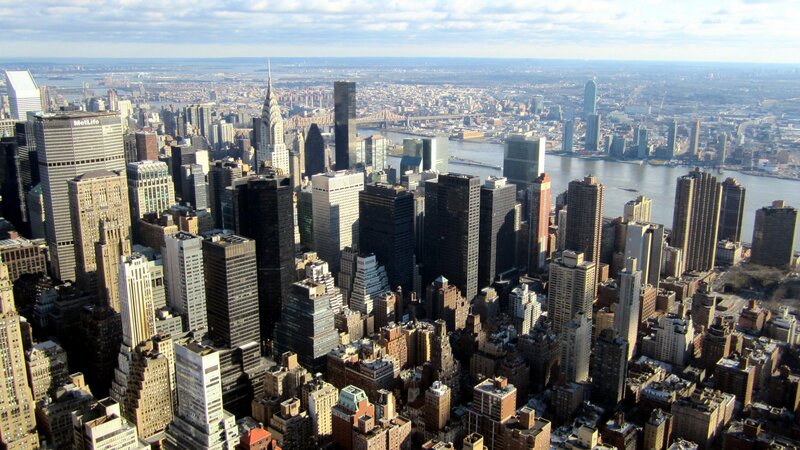 If you get down to the financial district early, check out Century 21. They won’t try to sell you some property, but they have some great designer clothing on the cheap, plus the place is huge to roam. Richard Avedon changed the way fashion photography was approached and done by injecting emotion and movement into an emotionless style up to that point. In the exhibition Avedon Fashion, 1944–2000, one of the largest to date of his work, looks at his long career, with vintage photos, contact sheets, magazine layouts, and more. At Zip Burger they offer farm-raised, organic, and grass-fed meat and poultry, letting you build your own burger with plenty of gourmet toppings. The first time I went to Subway Inn I thought it was completely strange that there was a dive bar off Lexington Avenue, especially in this neck of the woods, but somehow it works. Born in the 30s, this bar has somehow remained, and thank god, as it’s easily the cheapest place in the area for a drink. For fans of Japanese pop-culture, Kinokuniya Bookstore has a large selection of Japanese themed books, videos, CDs, magazines, comics, and stationary.